Fast and efficient two-dimensional FFT core for image processing applications. Successful FPGA/ASIC implementation of two-dimensional FFTs (used in 2D image processing applications) requires deep understanding of the underlying 1D FFT algorithm, chip and memory architectures. Since each pixel of image data is effectively processed twice, the issues of throughput, scaling, resource usage, and memory interfacing all become intertwined when considering the optimal solution for the target chip architecture. Block diagram with external memory used for storage during the two required data transposes. The performance of a 2D FFT is limited by the bandwidth of the transpose memory. Each 2D FFT IP Core delivered by Dillon Engineering is configured to obtain maximum performance based upon the internal or external memory architecture available. 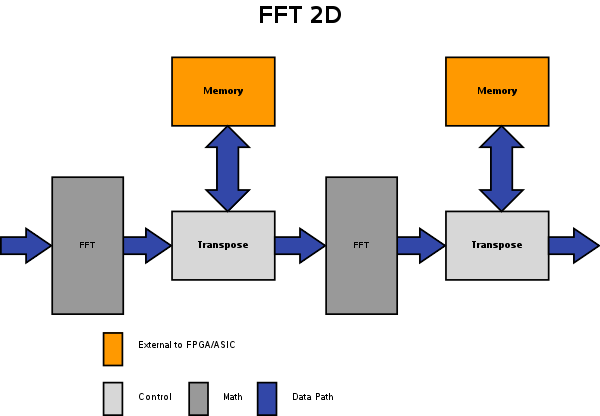 For details on 2D FFT algorithm processing, see our FFT Success article on the subject. Count on the experts at Dillon Engineering for fast and efficient implementation for all your image processing applications.